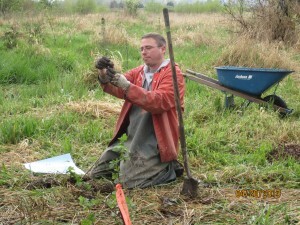 Ecologist Walter Rung demonstrates how to plant a native tree. 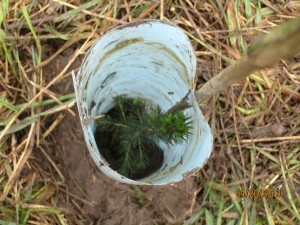 A plastic shield is placed around the tree in order to help it thrive and prevent it from being cut down when the invasive species are removed from the area. A peek iside that the freshly planted tree. Other environmental changes are being made such as improving natural channel formation and eventually removing the tide gate. The tide gate is located just south of the storm water Treatment Facility and should be taken down within a year. “We’re expecting once they remove the tide gate that there will be a lot more salmon in the creek,” said Walter Rung. 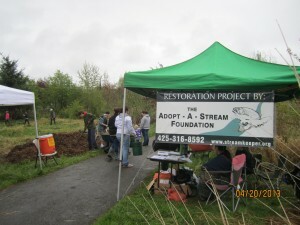 At the estuary project, informational booths and speakers informed people about how to protect the estuary and streams in the area by simple methods of not using toxic chemicals in their yards for weed control, disposing of pet droppings properly and regular maintenance their septic systems. 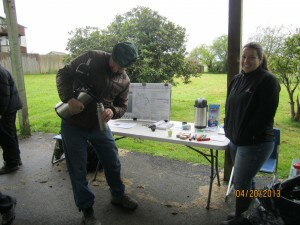 Staff from Tulalip Tribes Natural Resources Department explained the stages and reason of the restoration project and provided delicious samples of Sitka Spruce tea and Nettle Tea. Josh Meidav and Kelly Finley hosted The Tulalip Tribes booth. This project has been made possible through a large partnership between The Tulalip Tribes, City of Marysville, U.S. Army Corps of Engineers, National Oceanic and Atmospheric Association, Sound Transit, Wash. Dept of Fish and Wildlife, Wash. State Recreation and Conservation Office, Natural Resources Conservation Services, Snohomish Basin Salmon Recovery Forum, Sound Salmon Solutions and U.S. Fish and Wildlife Service. 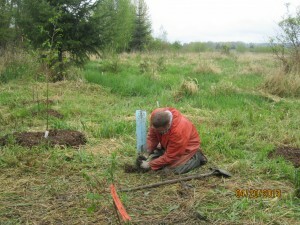 This entry was posted in News, Top Story, Tulalip News and tagged Adopt a Stream Foundation, Earth Day, Josh Meidav, Qwuloolt Estuary Restoration Project, Tulalip Tribes, Washington State Department of Ecology by admin. Bookmark the permalink.